Summer’s gift of friendship, flowers – and those who love them . 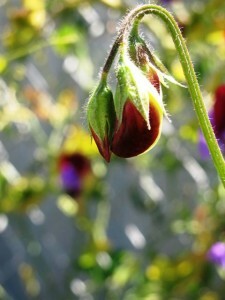 . .
A precious Sweet Pea – teardrop-like, it sparkles in the SF sunshine at Lila B's Lot Garden. We’ve been “on the road” for much of the past month, documenting the zeal of flower farmers, the artistry of floral designers, and the soulful stories of people who view flowers as a symbol of their values – values that elevate locally-grown, seasonally-harvested and sustainably-produced ingredients to an all-important place in the cycle of a perishable product – the simple bouquet of blooms you may place in a vase or present to a beloved. Many, many of our hours have been devoted to travel, interviews, photography, location-scouting, filming, styling, writing and more! We will have much to show for ourselves – soon – when these stories are fully developed. But since it’s been quiet here lately on this blog, we thought it would be fun to share a few behind-the-scenes candids. Please note: These are Deb’s photos – all taken on a Canon G10. I’ve learned much from Mr. Perry but these aren’t exactly ready for Prime Time. Enjoy them nonetheless. And perhaps you’ll learn a little more about what drives us professionally and creatively. 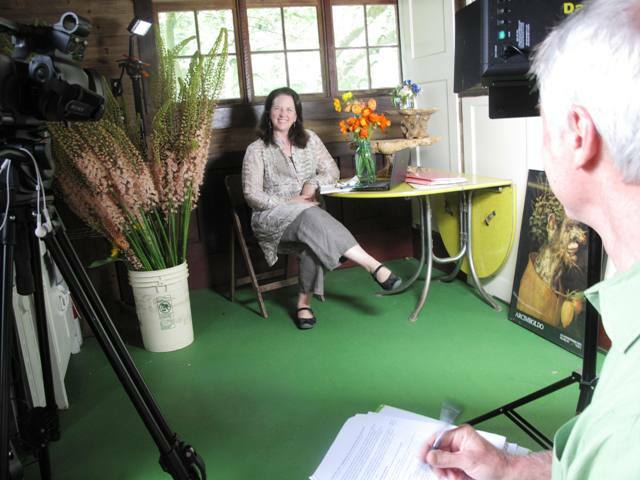 July 12-13 – Two days of filming for a segment called “Organic Flower Power” with Joe Lamp’l of PBS’s Growing a Greener World. We convened at Jello Mold Farm in Mt. Vernon and spent a day with Joe and his crew, director of photography Carl Pennington and cameraman Dave Pennington. Associate producer and friend Theresa Loe was not able to join us, but you can be sure that she was a major force in shaping the story. Carl Pennington, Joe Lamp'l & Dave Pennington – on location at Jello Mold Farm. Ready for my "close up" – I enjoyed being interviewed on camera by Joe Lamp'l. We spent all of our time discussing LOCAL flowers. Documenting the interview with Joe Lamp'l, host of Growing a Greener World. Our dear friend Diane Szukovathy, co-founder of Jello Mold Farm, with some of her yummy dahlias. On Day 2 of our adventure, we met up with Joe and his team at the Seattle Wholesale Growers Market Cooperative, where flower farmers sell direct to floral designers. 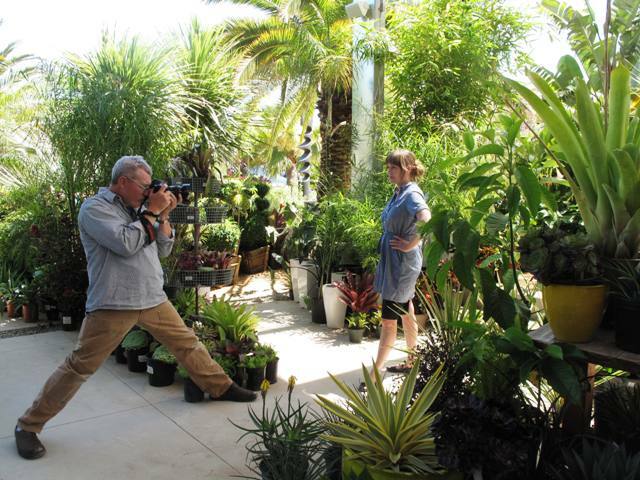 Joe's co-host, celebrity chef Nathan Lyon, had fun snapping pics at the Flower Market, before he went on camera. July 20 – San Francisco here we come! Just one week after filming the PBS segment, we hopped a plane and flew to San Francisco for four days of shooting. 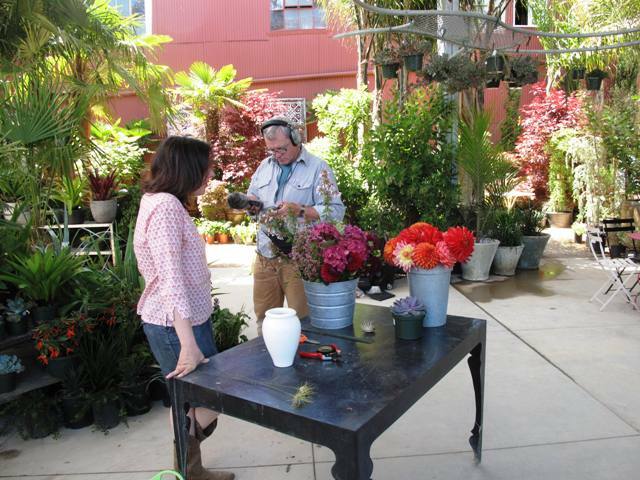 We started at Flora Grubb Nursery, where we filmed a floral-design segment with Susie Nadler, designer and owner of The Cutting Garden, a studio at Flora Grubb’s. 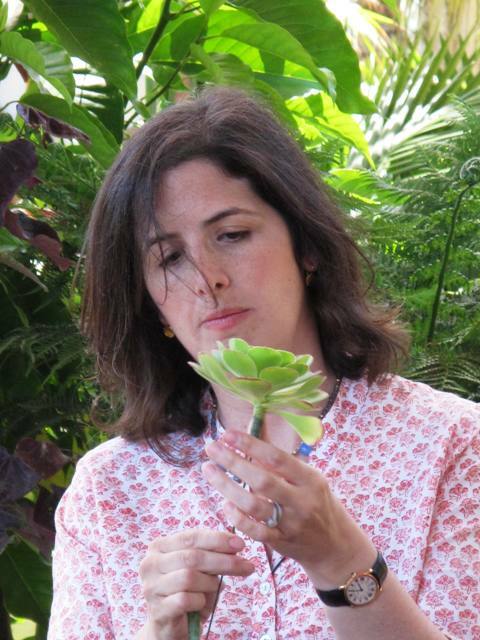 Susie graciously shared her secrets of designing bouquets with living succulents…beautiful!
. . . and David wore two hats – photographer and camera man! David captured many gorgeous portraits of Ms. Flora – in her tropical element! 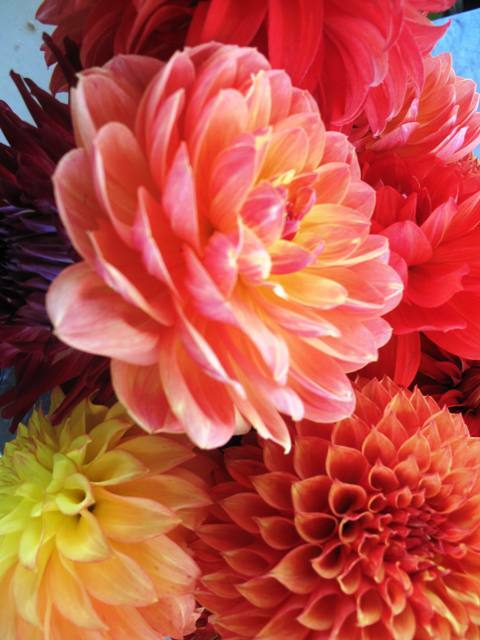 Breathtakingly beautiful dahlias, which Susie procured from a local grower. 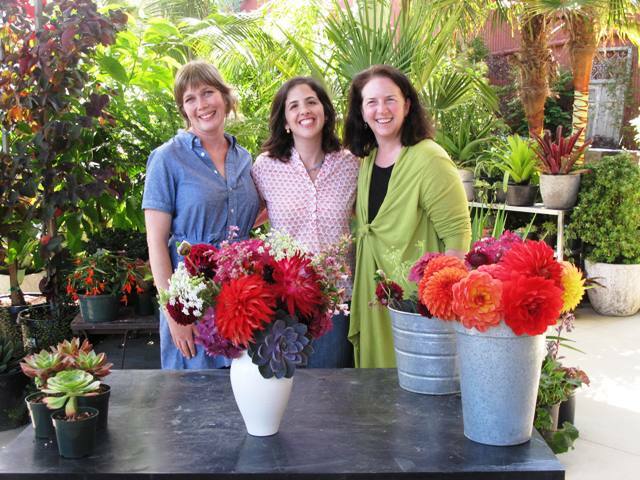 Flora, Susie and me – posing for a group shot after our filming at Flora Grubb Nursery. July 21: Next stop, a visit to Baylor Chapman’s Lila B. Floral & Event Design. I met Baylor last fall through Garden Writer friend Susan Morrison, when I was in SF to give a lecture for the Garden Conservancy. David capturing Baylor – on camera – at the Lila B. Lot Garden in SF's Mission District. July 21 (afternoon): After lunch, we met up with Julie Chai, friend and Sunset magazine’s senior garden editor. 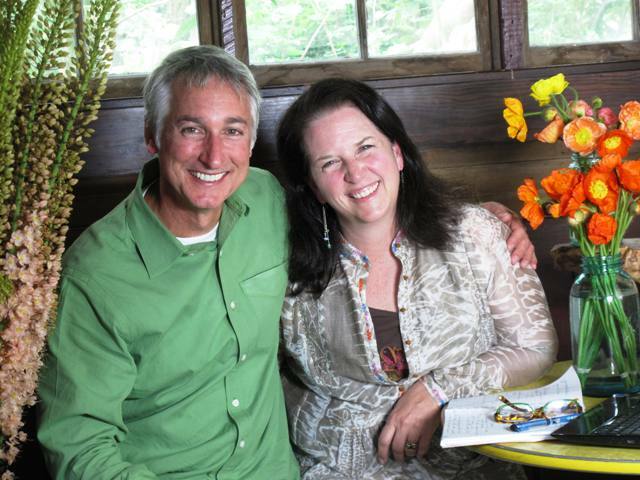 Julie opened up her private world to us, as she planned her wedding to George Lee. First stop . . . Corralitos Dahlias. We headed to this wonderful coastal dahlia farm owned by Kevin Larkin and his wife Karen Zydner. Kevin “custom grew” hundreds of gorgeous dahlias in Julie’s color palette — apricots, peaches and pale yellows – for her wedding bouquets. 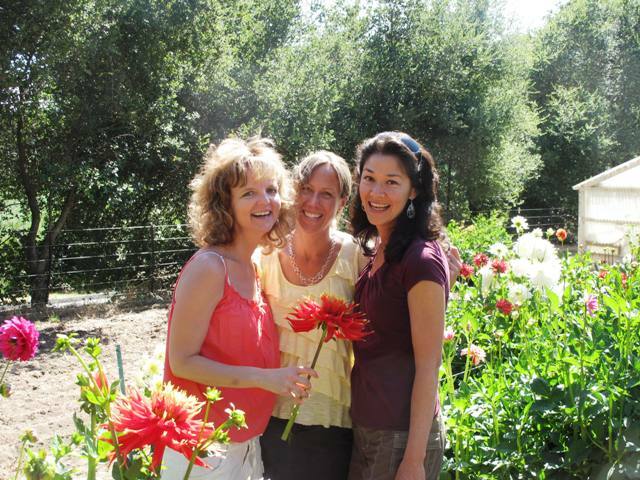 Julie (right) with two of her bridesmaids, sister-in-law Honey (left) and college gal-pal Mindy (center) – in a sea of dahlias. July 23: Yes, it was Julie’s big wedding day, but early that AM, we snuck away to Berkeley to meet up with Max Gill. Thanks to Flora – for her suggestion and introduction. Max is a gifted, intuitive designer who grows many of his own ingredients (or procures stems from local farmers). Max designs the restaurant arrangements for Chez Panisse, Alice Waters’ renowned Berkeley restaurant. Seriously, we tried NOT to hyperventilate when shooting Max at his craft. It was pretty magical! My herbal tea steeped while Max arranged his flowers at Chez Panisse. 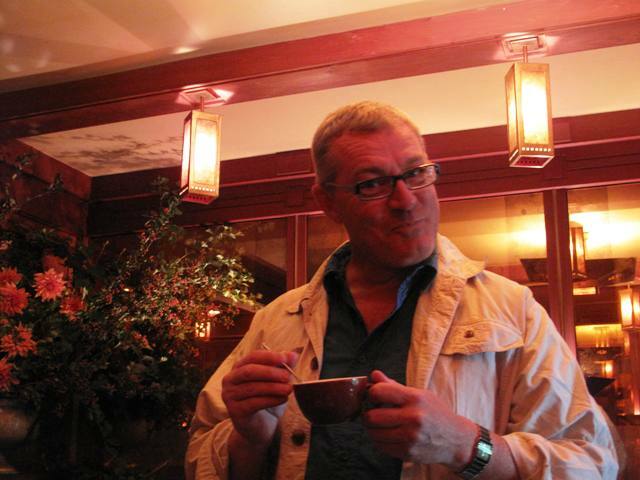 David's looking pretty happy about his unexpected chance to photograph at Chez Panisse! Life can't get much better, huh? 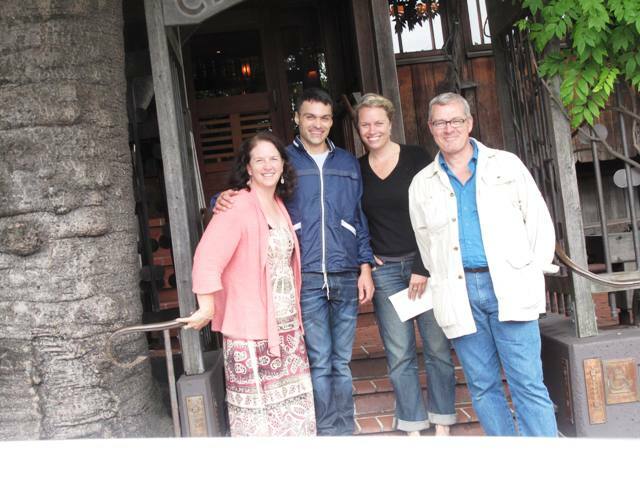 In front of Chez Panisse: Debra, Max Gill, his friend, floral designer Wenonah Webster, and David Perry. An unforgettable morning! Debra and David ~ We loved your visit, I thank you for you for seeking out and telling inspiring stories ~ and including Lila B. in your whirlwind Bay Area adventure. Wow, where do I sign up to be the assistant……? Previous post: Anacortes Flower Whisperer . . .